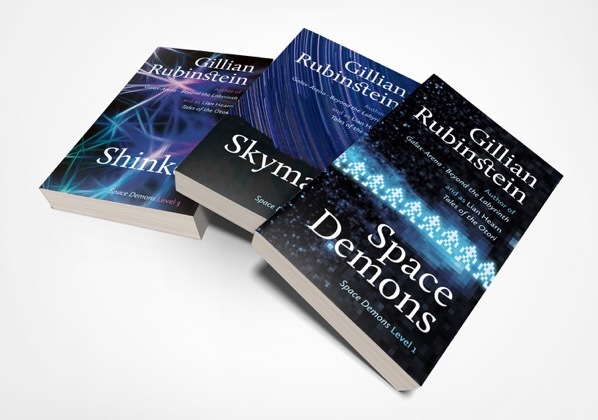 We’re over the moon to be publishing new editions of Gillian Rubinstein’s classic young adult trilogy Space Demons in paperback and electronic formats. First published in 1986, Space Demons was Gillian’s first novel. Set firmly in the 8-bit era and centred around an addictive computer game that dissolves the border between virtual and reality, it prefigured many of the themes that would be explored in books and films all the way up to Ready Player One. It was a best-seller in Australia and won many prizes including Honour Book in the Children’s Book Council Book of the Year Award for Older Readers (1987) and the inaugural Children’s Peace Literature Award (1987). Three years later, Skymaze took the series to another level with an even more complex and captivating game that expands to colonise the real world with life-or-death consequences for its young players. It was an instant hit and was shortlisted for the CBC Book of the Year Award for Older Readers (1990), the SA Festival Award for Literature (1990) and the Young Australians Best Book Award (1991–1992). Finally, in 1996 Shinkei tackled the emergence of the internet and artificial intelligence as it united the players with the author of the games in Japan. Described by one reviewer as “one of the best intertwinings of the personal with the political that I have ever encountered”, it completed an extraordinary series that kept pace with the technological developments of a critical decade and remains thrilling today. The Space Demons trilogy entranced a generation and inspired many of today’s young adult and science-fiction writers. It’s now available direct from the Ligature bookshop and the usual online bookshops. Ask for it at your local bookshop—if they don’t have it they can order it!